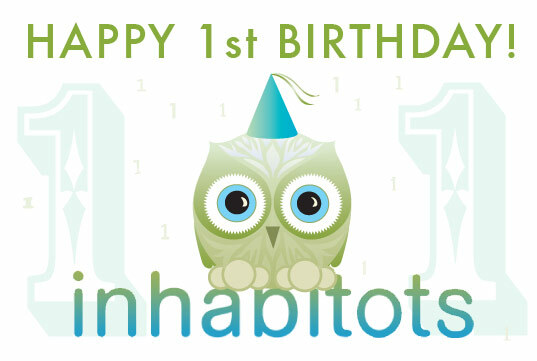 We’re thrilled to announce that Inhabitots is turning ONE today! Our baby blog is starting to grow up! We are so excited to be celebrating this milestone… we’re nostalgic about the journey we’ve taken thus far… and we look forward to many more fun filled years of bringing the latest and greatest in eco design for kids and babies. Please join us in taking a look back at Inhabitots’ TOP FIVE MOST POPULAR STORIES of all time… and find out what our biggest eco birthday wish is! The PlayPump system is bringing clean water into the hardest hit regions of Sub-Saharan Africa. There’s only one catch–users have to take a spin on the merry-go-round! The PlayPump has been installed in rural villages and primary schools where kids can easily access the fun, all the while pumping clean, potable water from underground up into a 660 gallon water tower above. Just when we thought we could not be more enamored of Glide’s TwistTogether LED blocks, we spotted this window display the company created for the Museum of Modern Art’s Midtown Manhattan store. 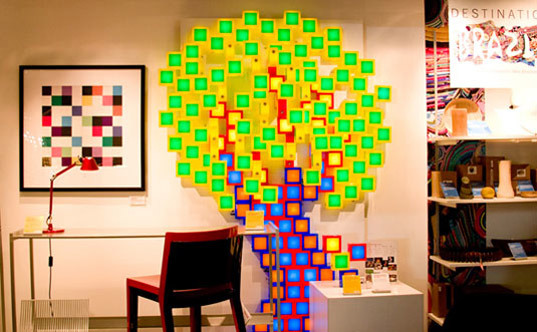 Using components from their technicolored “Candy” set, the designers pieced together a dazzling, psychedelic tree, complete with branches peeking from within its fluorescent yellow and green crown. Homemade cleaners smell better, work just as well, cut down on packaging, and save you money. Making eco-friendly cleaners is a very simple green step you can take at home, yet the rewards are huge – cleaner indoor air quality and a healthy, happy family. We’ve raved about the benefits of co-sleeping here at Inhabitots, as it makes life easier and healthier for both mother and baby and is helpful for creating a special bond between parents and children. However, it is not a good idea to try to cosleep in a raised bed‘family bed’ without some sort of modification. For those of you who are interested in co-sleeping, but have a raised platform bed, don’t worry! Check out the Arm’s Reach Co-sleeper – a small bassinet-type device that attaches to the side of your bed so that your baby can sleep safely in his own bed, just an arm’s reach away from you. And now for our birthday wish! 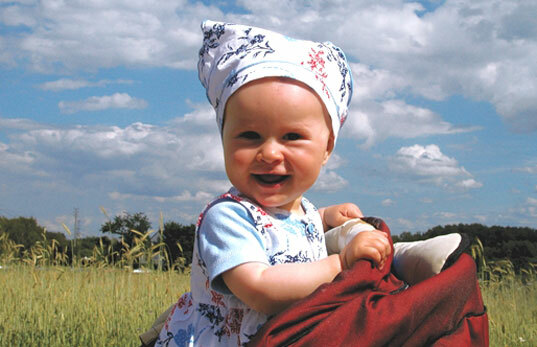 In true green birthday party fashion, our gift wish list is waste free and eco-friendly! As we blow out the candle on Inhabitots 1st birthday cake, we’re wishing for YOU to leave us a comment on what you’d like to see more of in the future when you log on to Inhabitots. What topics, products, subject matters, designs, quandaries, etc. would you like to see us cover? In the birthday spirit, we’re giving away 20 Inhabitots t-shirts (or onesies) to the first twenty commenters, so leave a comment today! Thank you for reading Inhabitots and here’s to ‘many more’ years! Happy Birthday Inhabitots! May your second year be as fruitful as the first. I look forward to the information you have to bring during the coming year! Happy Birthday Inhabitots! May you have many many more! Happy Birthday! What great photos! Happy birthday! I love the features on toys and activities. I'd love to see posts on affordable greeness. A Very Happy Birthday, Inhabitots! I'm waiting for my five month old daughter to be old enough to read your site. Keep helping me and my wife bring her up in a clean, green home! Happy First Birthday, Inhabitots! I love reading this blog as I raise my own little tree huggers. Please continue to run articles not only on the latest and greatest in green products, but also on how to make better use of what we already have - reusing and repurposing items to cut down on consumption. Keep up the great work! You guys rock! We love all of you and thank you for making this past year the best! Happy Birthday! I love reading all your posts, even though I don't have children. They're always insightful and full of great tips, ideas, and products that are available. So similar types of articles, I guess ^_^;! Happy Birthday! I would like to see more kids room decor, and eco/organic products that relate to food allergies. :-) Keep up the good work! Happy Birthday! Love the site. I would like to see more kids room decor, and any products/foods related to food allergies and skin sensitivities. 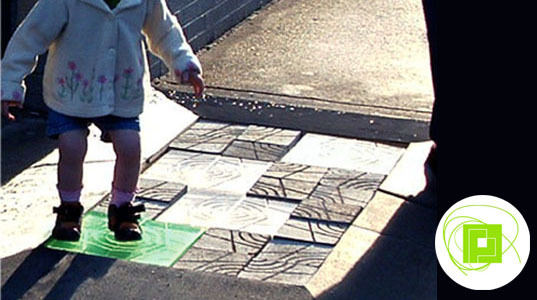 Anything that is green, well-designed and affordable is always great, too! Wow! One year, that's great!! I am so glad I found this site when I did, which I know was last year sometime. I would like to see more things on here that are more within my budget, stuff I can get for our family that makes day to day living way more green, but also attainable to us. I love finding out about new products and web sites from you, so keep em coming! Thanks! Happy Birthday Inhabitots! I was just introduced to you today by a good friend. I am pregnant with my first baby and even more inspired than ever to be green. I'd like to continue seeing more of what I read in your newsletter today. Thank you for the information on all the genius green innovations! Happy 1st Birthday!! I enjoy reading because I see so many green wonderful and different items that I have never seen before. I hope you continue so I can be in awe!! Thanks and many more happy years! Happy Birthday! Keep inspiring us in every which way!!! Congratulations! Looking forward to many more years together! Wishing you a very happy birthday! I found this site around the time my husband and I were thinking of adding a new addition to our family, and now our first son is due in two months! I have LOVED keeping up with every post through my Google Reader -- and I end up sharing almost all of them with my friends -- so keep up the good work! I have especially enjoyed all the info on cloth diapers and all of the innovative products that help make life easier. I hope that you continue to do what you do. Thanks for the t-shirt! My daughter loves it!! It was a nice surprise in the mail for her, so much so that the next day, when we were getting the mail, she said "I think there is another t-shirt for me in the mail". Aww. Thanks again! We're thrilled to announce that Inhabitots is turning ONE today! Our baby blog is starting to grow up! We are so excited to be celebrating this milestone... we're nostalgic about the journey we've taken thus far... and we look forward to many more fun filled years of bringing the latest and greatest in eco design for kids and babies. Please join us in taking a look back at Inhabitots' TOP FIVE MOST POPULAR STORIES of all time... and find out what our biggest eco birthday wish is!